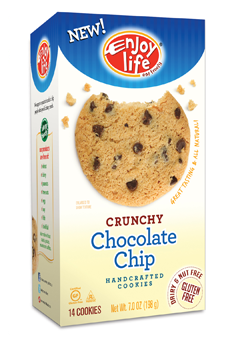 I recently had the pleasure of trying out all four varieties of the new Crunchy Cookie line from Enjoy Life Foods. I love cookies, as you may have noticed, so I was very excited to try these. When I opened the box, the first cookies I saw were the Vanilla Honey Graham. I know there are GF Graham crackers/cookies out on the market these days, but I have not tried any of them yet. I haven't had graham crackers in years and I love them. These did not disappoint. 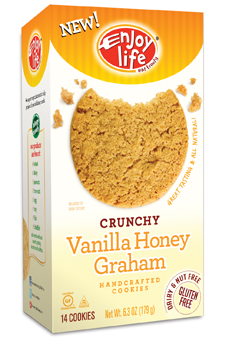 They are sweet and super crunchy with that old familiar graham flavor and a hint of vanilla and honey. I plowed through the whole box. The next box I dove into was the Double Chocolate. Double Chocolate Chip cookies are my all time favorite. And these were awesome. 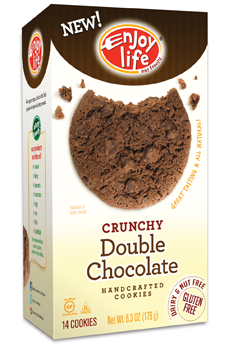 Again, super crunchy with great chocolate flavor. I was supposed to bring all of these boxes down to the Cape for our vacation, but somehow I managed to finish ALL of them before we even left. I have a problem... it's bad. Next up comes the Chocolate Chip. What can I say? Another big hit. These reminded me of Chips Ahoy only thinner. They have that great, familiar chocolate chip cookie flavor. I actually bought myself another box of these cookies last week. I wanted to make an ice cream sandwich with them. And I did. And it was amazing. And last but not least we have the Sugar Crisp cookies. I have to admit that these were my least favorite... although that is definitely not to say that I didn't like them! But while I'm a giant cookie lover, sugar cookies have always been the black sheep of the cookie family for me. I used to be so disappointed when my mom would make sugar cookies. It's one of the very few cookies that I would rather just not eat. I can't believe I even typed that sentence! But seriously, these are really good too. 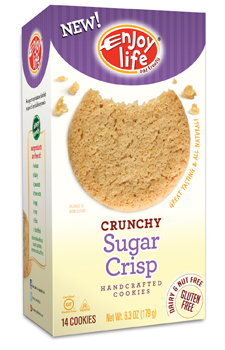 I highly recommend the entire line if you're a crunchy cookie fan. We loved these cookies! It is so nice to have options!! I've been wondering how these are! Thanks for the review!